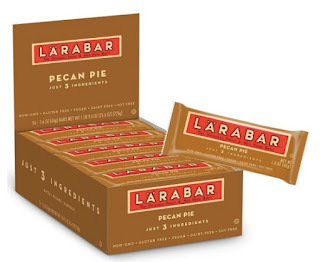 The Frugal Family Life: Amazon.com: Larabar Gluten Free Bars (16 count) as low as $8.52 shipped! Hurry over to Amazon where you can get these Larabar Gluten Free Pecan Pie Bars (16 count) for just $8.52 shipped when you clip the $2 off e-coupon and checkout through Subscribe & Save! Also, you can find these Larabar Gluten Free Carrot Cake Bars (16 count) for just $8.81 shipped when you clip the $2.50 off e-coupon and checkout through Subscribe & Save!